WordPress Plugin Updater Beta Test! Today I have a little surprise for all of you, I’ve written a new plugin which I find extremely useful, I’ve dubbed it “Plugin Updater”. Not the most imaginative name, I know. Once it’s installed it adds a new button to the plugin update notification bar, shown in the image to the right. When you click the “Update Now” button it will automatically download the update from WordPress extend and extract it to your plugins directory. Upload the folder `plugin-updater` to the `/wp-content/plugins/` directory. Activate the plugin through the `Plugins` menu in WordPress. This isn’t an official release, I’ve still got a lot of testing to do so I’m not offering any support. If you find any bugs it would be greatly appreciated if you let me know. NOTE: There’s a known conflict issue with my “Flickr Manager” plugin, which I’ve since had to patch, so if you’re experiencing troubles with it not doing anything when you click the “Update Now” button, please redownload Flickr Manager (or deactivate and click “Update Now” for versions earlier than 1.4.01). CLICK ME! I do stuff. Also another feature I added was if you don’t have cURL installed on your web host it will now use fopen instead. NOTE: File uploads to Flickr won’t work unless you have cURL installed. So if everything is working except uploads, you must install cURL! Like I said earlier, I didn’t have as much time as I would have liked to test this so I’m releasing it as a beta. If you find any errors, please let me know. Thanks. Well I just got back from my Christmas break and started to follow up the feedback I received while I was away. This led to several bug fixes and a few changes, one of which being you now simply click on the photo and it will be inserted into tinyMCE rather than drag and drop. Although drag-drop will still function, if you want the image to be wrapped in it’s associated link as stated in the Flickr Community Guidelines just click on the image once you’ve selected your size. A few bugs have been resolved such as when trying to upload or browse photos with a low privileged account returned “Unauthorized Access“. A problem with the Flickr panel not maintaining the current page after changing the image size has also been fixed. If you find any other bugs please let me know. As usual the updated version can be found at the WordPress extend page. After about three weeks of waiting my Flickr Manager Subversion repository finally got approved over on the WordPress.org extend page. I’ll be using that to release the latest versions of my plugin, and because it’s only relatively new I’m in a frantic effort to iron out as many bugs as possible, so please email me or leave a comment with as many specific details as possible of any finds. Also if you have any great ideas or improvement suggestions just let me know, I’m always looking for ways to improve it. Since its release on WordPress.org I had to make a minor release change to account for the change in directory name on my repository. WordPress Flickr Manager v1.1.1 contains a few bug fixes and a plugin directory name change and is available here. Edit: I just released 1.1.2, in which I converted all AJAX requests to use the prototype library. At long last! If you’ve been waiting on the edge of your seat for the release of WordPress Flickr Manager 1.1, your week long journey is finally at an end. With this latest arrival, I added a few bells and whistles which have made my ‘Flickring’ and blogging all the easier, such as the new ‘Flickr Manager’ panel that appears now just below the tinyMCE editor in your administration panel. This new addition is feature packed, it allows for drag-drop image insertion into your posts, as well as a new and improved upload form. The browse panel allows for filtering of images through the use of a tag search, as well as the selection of the various image sizes that Flickr have to offer (remember you can still customize the size of the image from within tinyMCE). The time where you would have to leave your post, go to Flickr and copy the code for your image is at an end. Now it’s as simple as drag and drop. This brings me to the next tab on the panel, the shiny new upload form. From here I can upload new images, including various meta details such as the title, tags, and the description. It’s now all strapped together with AJAX style functionality so you’ll never have to leave your post for anything. The files are available in zip and tar.gz. [img:2039394071,thumbnail]I had a good time last weekend in Melbourne, had some great food, saw the sites and attended a WordPress event WordCamp. WordCamp was a gathering of geeks with a vision, and that vision was WordPress. The day was action packed with a load of presentations and round-tables, amongst the speakers were Alex Shiels (Automattic), who was telling us about how much wordpress.com had grown and a few of their operational details. A special acknowledgment goes to James Farmer (Edublogs), for which none of this would have been possible without him. Other speakers included Darren Rowse (problogger.net) and Christine Davis (Ultimate Tag Warrior). [img:2040195496,thumbnail]The event took place at the Watermark Bar whose logo eerily resembled the WordPress trademark ‘W’. The venue was nice; it had an almost serene like water front view of the Docklands, unfortunately in all the excitement I didn’t get to many photos. Here’s a couple (courtesy of my Flickr Manager plugin) from when they were still decking the place out. In all fairness, any place I go where I leave full of party pies, spring rolls and a shiny new WordPress t-shirt (it’s red, but why then, don’t I blog any faster?) is top notch in my books. Recently I’ve been playing around with Microformats, more specifically hAtom. As an experiment, I converted this sites feed to a dynamically generated microformat based feed. After doing some reading I came across this little gem, hAtom2Atom, this is where the fun began. I added in the necessary class declarations to my theme according to the hAtom specification and then it was time to get the ball rolling. To speed things up, I found this little script, which provided me with everything I needed to get this operational. The results exceeded my expectations, not only does it work for my main feed, but if I wanted to generate any sub-feeds (i.e. a feed for all posts tagged with WordPress) they were covered. All I had to do was subscribe to http://tgardner.net/hatom2atom.php/path/to/whatever/, and I’m sure with a little mod-rewrite I could pretty up the URL a bit. If you’re using a feed reader you can leave out the hatom2atom.php and it will automatically be inserted using the alternate link in the header (i.e. you can subscribe to http://tgardner.net/). If you want to try this for yourself I threw together a zip of all of the files I needed. Just extract them to the root of your WordPress install and modify the header in your theme like above. When I first started working at DIRC in August, this year. I had my first look at WordPress, using it as the CMS for the “History of Disability in South Australia” project. This was the beginning of my journey to immerse myself in all things WordPress. In a more recent project I had the problem of developing a system for keeping Image Management on Flickr as simple as possible so other staff could add images to their posts without leaving the CMS. This brings me to the introduction of “WordPress Flickr Manager 1.0” available in zip, rar, and tar.gz. View or delete your images. 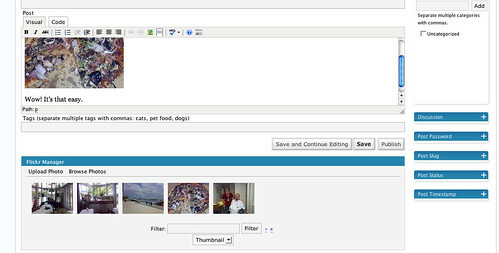 Edit image tags, permissions, title, description, etc. Insertion into posts using [img:<flickr-id>,<size>]*.